As the Ca2+-sensor for Ca2+-dependent inactivation, calmodulin (CaM) has been proposed, but never definitively demonstrated, to be a constitutive CaV1.2 Ca2+ channel subunit. Here we show that CaM is associated with the CaV1.2 pore-forming α1C subunit in brain in a Ca2+-independent manner. Within its CaM binding pocket, α1C has been proposed to contain a membrane targeting domain. Because ion channel subunits assemble early during channel biosynthesis, we postulated that this association with CaM could afford the opportunity for Ca2+-dependent regulation of membrane targeting. We showed that the isolated domain functioned as a Ca2+/CaM regulated trafficking determinant for CD8 (a model transmembrane protein) using fluorescent-activated cell sorting analysis and, using green fluorescent protein-tagged α1C subunits expressed in cultured hippocampal neurons, that Ca2+/CaM interaction with this domain accelerated trafficking of CaV1.2 channels to distal regions of the dendritic arbor. Furthermore, this Ca2+/CaM-accelerated trafficking was activity dependent. Thus, CaM imparts Ca2+-dependent regulation not only to mature CaV1.2 channels at the cell surface but also to steps during channel biosynthesis. Neuronal responses to electrical activity, such as neurotransmitter release or long-term potentiation, result from changes in intracellular Ca2+, which modulates a multitude of Ca2+ binding proteins (CaBPs) with distinct but overlapping effectors. Because ion channels are among these effectors, Ca2+ can provide feedback regulation to the very proteins that regulate membrane excitability. Most extensively studied is Ca2+-dependent inactivation (CDI) of L-type CaV1.2 Ca2+ channels (Budde et al., 2002). The CDI sensor is thought to be calmodulin (CaM), the prototypical CaBP. CaM controls CDI through interaction with a ∼110 aa binding pocket in the C terminus (CT) of α1C in which one critical determinant is a consensus CaM binding “IQ” motif (Peterson et al., 1999; Zühlke et al., 1999). Other sites in the binding pocket are also essential, and mutations throughout the binding pocket that disrupt CaM interaction occlude the expression of CDI (Kim et al., 2004). Based on biochemical, imaging, and functional analyses, CaM has been predicted (but never definitively demonstrated) to be an obligate CaV1.2 subunit, bound to α1C in basal levels of [Ca2+]i and poised to trigger CDI when [Ca2+]i increases (Pitt et al., 2001). Because ion channel subunits associate early during channel biosynthesis (Deutsch, 2003), we hypothesized that CaM could also affect diverse processes during channel biosynthesis in addition to regulating CDI. Thus, it was particularly intriguing that the α1C CT contains a domain within the CaM binding pocket that is necessary for proper plasma membrane targeting of CaV1.2 channels (Gao et al., 2000). Because CaV1.2 channels are central to cAMP response element-binding protein (CREB)-dependent gene expression paradigms in the hippocampus that underlie learning and memory and specific targeting of CaV1.2 channels is necessary for CREB-dependent gene expression (Deisseroth et al., 2003; Weick et al., 2003), we postulated that Ca2+/CaM may regulate CaV1.2 trafficking in hippocampal neurons, thereby contributing to activity-dependent gene expression paradigms. The green fluorescent protein (GFP)–α1C construct was constructed as described previously (Grabner et al., 1998). The GFP–α1C–CaM and GFP–α1C–CaM1234 concatemers with a 12× glycine linker between the truncated α1C (at amino acid 1669) and CaM or CaM1234 were generated following the general strategy as outlined previously (Mori et al., 2004). The myc–CD8–Ca2+ in activation region peptide (CIRP) constructs were generated by standard molecular biology techniques. The construct consists of an extracellular myc tag linked to the extracellular and transmembrane domains of CD8α (amino acids 1–206) linked to the CIRP region of α1C (amino acids 1507–1669). Human embryonic kidney 293T (HEK293T) cells were maintained in 5% CO2 at 37°C in DMEM supplemented with 10% FBS, l-glutamine, penicillin, and streptomycin. Cells were transfected using calcium phosphate (Chemicon, Temecula, CA). In brief, 11–21 μg of DNA in toto were used to transfect cells grown to a ∼60% density on a 6 cm dish. The DNA ratio of GFP to myc–CD8–CIRP was 1:10. When CaM or CaM1234 was cotransfected with myc–CD8–CIRP, the DNA ratio of CaM to myc–CD8–CIRP was 1:1. Cells were harvested ∼40 h after transfection and surface stained with an anti-myc antibody conjugated to the fluorophore PBXL-3 (Martek, Columbia, MD). Staining was performed following a standard fluorescent-activated cell sorting (FACS) staining protocol with at least 45 min of incubation with a 1:100 dilution of the antibody. The FACS wash used during spins and staining contained 1% BSA and 0.1% sodium azide in PBS. Cells were fixed with 4% paraformaldehyde in PBS. Samples were analyzed on a BD LSRII at the Columbia University Flow Cytometry Facility. A total of 30,000 cells were collected for each sample for each of three trials. The LSRII uses BD FACS DiVa software. Data analysis was performed using Flow-Jo (version 8.1.0), and statistical comparisons were done using Student's t test. HEK293 cell culture and transfection for electrophysiology and confocal imaging. HEK293 cells were maintained in 5% CO2 at 37°C in DMEM supplemented with 10% FBS, l-glutamine, penicillin, and streptomycin. A stable cell line expressing the calcium channel auxiliary subunits β1 and α2δ was maintained as above with the addition of G418 (500 μg/ml). Cells were transfected using CaCl2. In brief, 5–10 μg of DNA in toto were used to transfect cells grown to a ∼25% density on a 10 cm dish. When GFP was used to visualize transfected cells, the DNA ratio of GFP to α1C was 1:10. When CaM or CaM1234 was cotransfected with α1C, the DNA ratio of CaM or CaM1234 to α1C was 10:1, increasing the likelihood that cells transfected with α1C also contained transfected CaM or CaM1234. Electrophysiological recordings were performed 2 d after transfection. Whole-cell patch-clamp currents recorded from HEK293 cells were obtained with an Axopatch 200B amplifier. The internal pipette solution contained the following (in mm):190 N-methyl-d-glucamine (NMG), 5 EGTA, 4 MgCl2, 40 HEPES, pH 7.25, and 2 ATP, supplemented with 12 μm phosphocreatine. The external solution contained the following (in mm): 130 NMG-aspartate, 1 MgCl2, 10 glucose, 10 4-aminopyridine, 10 HEPES, pH 7.4, and 10 BaCl2. Series resistance was compensated by 70%. Currents were sampled at 10 kHz and filtered at 2 kHz. Gating currents were obtained by depolarizations to the reversal potential. Data are presented as mean ± SEM. For confocal imaging, HEK cells grown on coverslips were rinsed with PBS, fixed with ice-cold methanol, and mounted in Citifluor. Images were obtained on a Zeiss (Oberkochen, Germany) LSM 510 confocal microscope at the Columbia University Health Sciences Optical Microcopy Facility. Hippocampi from 1–2 d newborn rats (Sprague Dawley strain) were dissociated through enzymatic treatment with 0.25% trypsin and subsequent trituration. The cells were plated on glass coverslips previously coated with poly-d-lysine. Hippocampal cells were grown in neurobasal A medium (Invitrogen, Carlsbad, CA) supplemented with 2% B27, 2 mm glutamine, and 10% heat-inactivated bovine calf serum. After 24 h, this medium was replaced by one containing 0.5 mm glutamine, 1% heat-inactivated bovine calf serum, 0.5 mm kynurenic acid, 70 μm uridine, and 25 μm 5-fluorodeoxyuridine. Hippocampal neurons grown for 6–7 d in culture were transfected with the indicated plasmids using calcium phosphate precipitation, as described previously (Deisseroth et al., 1998). Some neurons were cotransfected with red fluorescent protein (RFP) (pDsRed2; Clontech, Mountain View, CA). Fluorescent images in live cells were obtained at 1, 3, 5, and 14 d after transfection. When testing the activity dependence of trafficking, cells were made quiescent 6 h after transfection by incubation for 60 min in Tyrode's solution containing (in mm) 119 NaCl, 3 KCl, 20 HEPES, 2 CaCl2, 2 MgCl2, 30 glucose, and 1 μm TTX, pH 7.3, and then stimulated with hyperkalemic solution containing the following (in mm): 77 NaCl, 45 KCl, 20 HEPES, 2 CaCl2, 2 MgCl2, and 30 glucose, pH 7.3 for 3 min. All images were acquired using a Bio-Rad (Hercules, CA) MRC 1000 confocal laser scanning system coupled to a Zeiss Axiovert 100 inverted microscope. For each image acquisition, a Kalman average of five frames was used. Trafficking was quantified by measuring the longest fluorescent dendritic branch with NIH ImageJ 1.35p, and data were analyzed with the Kolmogorov–Smirnov test. Adult rat brain was washed twice with ice-cold PBS and homogenized with glass homogenizer 20 times in 4 vol of ice-cold PBS with protease inhibitor cocktail (Roche, Indianapolis, IN). The homogenate was centrifuged at 16,000 × g at 4°C for 20 min. The pellet was resuspended in 150 mm NaCl, 50 mm Tris, pH 7.5, 10 μm CaCl2 (buffer A) plus protease inhibitors and 1% Triton X-100 and incubated for 1 h at 4°C and then recentrifuged. Protein (1.8 mg) was incubated in buffer A plus 0.25% Triton X-100 and free Ca2+ as indicated (Ca2+ buffering was performed with 5 mm BAPTA using calculations derived from WEBMAXC STANDARD, http://www.stanford.edu/∼cpatton/maxc.html). Anti-α1C (Alomone Labs, Jerusalem, Israel) was added to the samples, which were incubated for 1 h at 4°C, and then overnight at 4°C with protein A plus G beads. Samples were washed with buffer A plus 0.25% Triton X-100 supplemented with free Ca2+ as indicated and protein (10 μg) was loaded on SDS-PAGE gels. For anti-α1C immunoblot, protein was transferred to nitrocellulose. For anti-CaM immunoblot, protein was transferred to polyvinylidene difluoride at 4°C for 16 h in 50 mm potassium phosphate, pH 7.0, and fixed to the membrane by incubation with freshly prepared glutaraldehyde (0.2% in the phosphate buffer) for 20 min. EGTA (1 mm) was added to all samples before SDS-PAGE. Immunoblots were performed with anti-CaM antibody (Upstate Biotechnology, Lake Placid, NY). For GFP immunoblots, HEK293 cells were washed with ice-cold TBS (150 mm NaCl and 50 mm Tris, pH 7.5), harvested, and resuspended in ice-cold TBS with 1% Triton X-100 and protease inhibitor 2 d after the cells had been transfected with the respective plasmids. Cells were lysed by pipetting up and down and then centrifuged at 16,000 × g for 20 min. Protein was then separated by SDS-PAGE, transferred to nitrocellulose, and immunoblotted with anti-GFP antibody (Covance, Princeton, NJ). To test whether CaM is constitutively associated with CaV1.2 in tissue, we checked whether CaM coimmunoprecipitated with α1C from rat brain lysates. As shown in Figure 1A, CaM was detected in α1C immunoprecipitates when elevated Ca2+ (10 μm) or nominal basal Ca2+ (100 nm) was added to the buffer. These results suggested that CaM functions as a true channel subunit and remains associated with CaV1.2 channels at basal levels of Ca2+. Constitutive association of CaM with α1C in brain promotes activity-dependent CaV1.2 trafficking. A, Immunoblot for α1C (top) and CaM (bottom) after immunoprecipitation of α1C in the presence of 10 μm Ca2+ or 100 nm Ca2+. IgG controls were performed and did not show α1C immunoprecipitation (data not shown). B, Immunoblot for GFP of lysates of untransfected HEK cells or cells transfected with GFP, GFP–α1C, or GFP–α1C (TLF). Single arrowhead, GFP–α1C; double arrowhead, GFP. C, Fluorescent confocal images of hippocampal neurons transfected with RFP and cotransfected with GFP–α1C, GFP–α1C (I/E), or GFP–α1C (TLF). Scale bar, 20 μm. D, Normalized frequency versus distance from soma of GFP in the longest dendrite for each neuron for GFP–α1C (n = 193), GFP–α1C (TLF) (n = 108), and GFP–α1C (I/E) (n = 55) in cultures imaged 3 d after transfection. E, Normalized frequency versus distance from soma of RFP in the longest dendrite for each neuron for GFP–α1C (n = 63), GFP–α1C (TLF) (n = 64), and GFP–α1C (I/E) (n = 55). F, Normalized frequency versus distance from soma of GFP in the longest dendrite for each neuron stimulated with 45 mm K+ for 3 min at 6 h after transfection (n = 69) versus GFP without stimulation (control, n = 70) and imaged 24 h after stimulation. G, Same as in F, but for GFP–α1C (n = 115, stimulated; n = 55, control). H, Same as in F, but for GFP–α1C (I/E) (n = 53, stimulated; n = 52, control). I, Same as in F, but for GFP–α1C (TLF) (n = 41, stimulated; n = 41, control). The previous identification of a plasma membrane targeting sequence (amino acids 1623–1666) within the CaM binding pocket of α1C (Gao et al., 2000), and the constitutive nature of the interaction between CaM and α1C led us to investigate whether CaM regulated α1C trafficking in hippocampal neurons. In this role, CaM could allow Ca2+-dependent trafficking of α1C that was responsive to activity. To assess trafficking, we expressed a GFP-tagged version of α1C in cultured hippocampal neurons. The addition of GFP to the α1C N terminus does not alter any functional properties of CaV1.2 channels (Grabner et al., 1998) and was thus a convenient tool for visualizing the subcellular distribution of channels. GFP–α1C showed intense signal in the soma and prominent fluorescence throughout the dendritic arbor (Fig. 1C), consistent with the pattern observed previously in hippocampal neurons after transfection of GFP–α1C or immunocytochemistry of endogenous α1C (Obermair et al., 2004). Immunoblots of GFP–α1C expressed in HEK cells confirmed that the fluorescent signal represented GFP–α1C and not cleaved GFP (Fig. 1B). To assess trafficking of CaV1.2, we first devised a metric in which we measured the distance from the soma to the farthest GFP fluorescent point in the longest dendrite in each neuron and plotted these data as a normalized (to the number of neurons in each dataset) frequency distribution. We compared the normalized frequency distributions for a wild-type (WT) α1C, an α1C with 1591TLF1593 mutated to AAA (TLF), and an α1C with I1654E (Fig. 1C). We had shown previously that both mutations, I/E in the IQ motif (I/E) and TLF in a separate region of the CaM binding pocket, disrupt CaM interaction with the α1C C terminus (Kim et al., 2004). As shown in Figure 1D, the CaM disrupting mutations significantly reduced α1C trafficking assessed 3 d after transfection. This was not attributable to a mutant-induced decrease in dendritic length because cotransfection of RFP in a subpopulation of these cells showed that dendritic length was unaltered (Fig. 1E), nor was it attributable to a decrease in mutant protein expression because the TLF mutant was expressed at similar levels to WT GFP–α1C, as shown in Figure 1B. The potential role for CaM in trafficking of α1C prompted us to test whether this process was sensitive to neuronal activity and the consequent Ca2+ influx that could activate CaM. We therefore compared trafficking in neurons depolarized with 45 mm K+ for 3 min with neurons held quiescent. There was no activity-dependent change in distribution of GFP transfected as a control (Fig. 1F). However, when we compared GFP–α1C trafficking, we found that activity facilitated trafficking (Fig. 1G). The TLF and I/E mutations, in contrast, prevented activity-dependent facilitation of trafficking (Fig. 1H,I). Together, these data suggest that Ca2+/CaM may provide dynamic, activity-dependent trafficking to Cav1.2 channels. To determine whether the previously identified membrane targeting sequence in α1C (amino acids 1623–1666) contributed to Ca2+/CaM trafficking of Cav1.2 channels in hippocampal neurons, we first tested whether this isolated sequence supported Ca2+/CaM-dependent targeting of the unrelated, type I transmembrane protein CD8α, which is known to be constitutively trafficked to the plasma membrane (Iodice et al., 2001). We fused the CaM binding pocket of α1C (CIRP, amino acids 1507–1669) to the C terminus of a myc-tagged CD8α (myc–CD8–CIRP) and assessed whether Ca2+/CaM promoted its surface expression in HEK293 cells by comparing the effects of CaM versus CaM1234, a mutated CaM unable to bind Ca2+. The myc–CD8–CIRP was coexpressed with CaM or CaM1234, and surface expression was analyzed in nonpermeabilized cells by FACS. In these experiments, GFP was cotransfected to assess the success of transfection. As can be seen in Figure 2, no GFP signal or myc–CD8 surface labeling was detected in untransfected cells. In the absence of CaM or CaM1234 expression, ∼5% of the cells demonstrated surface expression of the myc-tagged construct; similar levels were obtained with CaM coexpression, suggesting that endogenous CaM was not limiting. In comparison, coexpression of CaM1234 reduced myc–CD8–CIRP surface labeling by 56 ± 6% (n = 3 transfections; p = 0.02), revealing that coexpression of CaM promotes significantly higher membrane targeting. These results indicate that CIRP may contain a retention motif that is masked by Ca2+/CaM. The presence of myc–CD8–CIRP surface labeling in cells cotransfected with CaM1234 could reflect either that Ca2+-free CaM is able to promote membrane targeting, albeit less effectively than Ca2+/CaM, and/or that the coexpressed CaM1234 did not completely preclude the actions of endogenous CaM. The CIRP region of α1C contains a forward-trafficking domain regulated by Ca2+/CaM. FACS analysis of HEK293 cells cotransfected with GFP, myc–CD8–CIRP, and either CaM or CaM1234 and stained with an anti-myc antibody. Surface staining for control untransfected cells (left), myc–CD8–CIRP plus CaM transfected cells (middle), and myc–CD8–CIRP plus CaM1234 transfected cells (right). Double-positive cells present in top right quadrant are shown magnified below. We next tested whether membrane targeting of α1C in HEK cells was affected by mutations that disrupted CaM binding. We measured the resultant currents of two different CaV1.2 channels containing CaM binding mutations in α1C (I/E and TLF as in Fig. 1) and currents from channels containing WT α1C. As shown in Figure 3, A and B, current amplitudes from both the I/E and the TLF mutants were decreased compared with WT α1C. To correlate whether this effect could be attributed to effects on trafficking/targeting, we used the GFP-labeled α1C and analyzed the fluorescent distribution for the WT and mutant channels. The GFP fluorescence pattern in cells expressing TLF or I/E was different from the pattern in cells expressing WT α1C. Rather than the plasma membrane-like pattern observed in cells expressing WT α1C, the pattern in cells expressing the mutant channels was more clustered toward the center of the cell in an endoplasmic reticulum-like pattern (Fig. 3C). We also measured gating charge (QON) during voltage steps to the reversal potential (Erev) to obtain a quantitative correlate of the number of functional channels at the cell surface. The decrease in QON for channels containing the CaM binding mutations suggested that there were significantly less functional channels at the plasma membrane than for the WT α1C (Fig. 3D). Mutations in the CaM binding domain of α1C affect channel targeting. A, Mutation of amino acids 1591TLF1593 to alanines (TLF) or mutation of I1654E (I/E) reduced current amplitude in HEK293 cells as shown by normalized I–V relationships of IBa (n = 5–7). B, Exemplar whole-cell IBa currents. Calibration: 200 pA, 200 ms. C, Representative confocal images of GFP-tagged α1C WT, TLF, and I/E and accompanying line scans showing altered cellular localization of the CaM binding mutants. D, Summary of ON gating current amplitude (n = 10–14) elicited by stepping to the reversal potential (Erev of approximately +55 mV). Exemplar current from a cell expressing the WT channel evoked by a 20 ms test pulse to +55 mV from Vh of −90 mV (Calibration: 2 nA, 20 ms), and a 250% magnification of the gating current is shown below. To confirm that these effects were attributable to CaM interaction with CIRP and to test the Ca2+ dependence of CaM-mediated trafficking, we compared the effects of CaM versus CaM1234. In an attempt to achieve effective competition between CaM1234 and endogenous CaM, we truncated α1C after the IQ motif at amino acid 1669 and fused CaM1234 (or CaM as a control) via a flexible 12 glycine linker, thereby providing a high local concentration of the mutant CaM. This general strategy, originally developed to assess the contribution of CaM to CDI, does not affect the resultant Ca2+ currents (Mori et al., 2004). An added advantage is that this approach restricts the actions of CaM1234 to α1C, limiting possible nonspecific effects on the myriad CaM-related pathways that could contribute to protein trafficking. In our α1C–CaM concatemers, we included GFP at the N terminus as shown in Figure 4A to correlate a quantitative assessment of channels at the plasma membrane (using electrophysiological recordings) with images showing the subcellular localization of the concatemers. Confocal images in Figure 4B of cells expressing the concatemers with CaM (GFP–α1C–CaM) showed a fluorescence pattern consistent with trafficking of the channels to the membrane and similar to GFP–α1C (Fig. 4B). In contrast, the predominant fluorescence in cells expressing concatemers with CaM1234 (GFP–α1C–CaM1234) was excluded from the cell periphery and was instead in a perinuclear distribution (Fig. 4B), suggesting that less channels trafficked to the plasma membrane. Peak currents recorded from these cells were markedly reduced compared with cells expressing GFP–α1C–CaM (Fig. 4C). QON during voltage steps to the Erev, normalized for cell capacitance because the cells expressing GFP–α1C–CaM1234 tended to be significantly larger than the cells expressing GFP–α1C–CaM, suggested that the linked CaM concatemers yielded significantly more functional channels at the plasma membrane than the linked CaM1234 concatemers (4.4 ± 0.7 vs 0.4 ± 0.3 mC/F; n = 5 each; p = 0.001). Thus, these data suggested that Ca2+/CaM is a potent stimulator for channel trafficking through its interaction with the targeting domain in α1C. 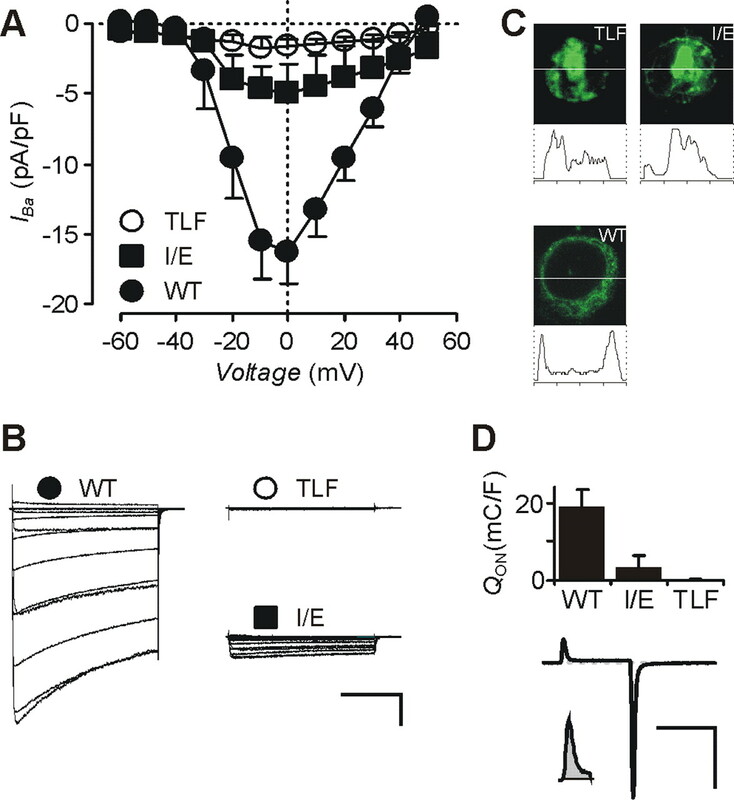 Trafficking of CaV1.2 channels to the plasma membrane is Ca2+/CaM dependent. HEK293 cells stably expressing β1 and α2δ were transfected with GFP-tagged α1C linked to either CaM or CaM1234 (A–C) or with GFP-α1C and additionally with CaM or CaM1234 separately (D). A, Schematic of the CaM-linked GFP-tagged α1C construct. B, Representative confocal fluorescent images and accompanying line scans of cells expressing GFP–α1C–CaM or GFP–α1C–CaM1234. C, I–V relationships of IBa currents for cells expressing GFP–α1C–CaM and GFP–α1C–CaM1234 (n = 7–11). D, I–V relationships of IBa currents for cells expressing GFP–α1C and CaM or CaM1234 (n = 7–11). As a control for the linked CaM strategy, we also assessed the trafficking/membrane targeting of α1C when CaM or CaM1234 was coexpressed separately. As seen in Figure 4D, coexpression of CaM generated significantly higher current density than coexpression of CaM1234. Gating charge measurements were also higher (5.6 ± 0.4 mC/F for coexpressed CaM vs 2.5 ± 0.8 mC/F for CaM1234; n = 5 each; P = 0.007) than coexpression of CaM1234. Thus, the CaM-mediated trafficking of α1C was Ca2+ dependent. Compared with the CaM1234-linked constructs (Fig. 4C), the effects with unlinked CaM1234 were diminished. This incomplete inhibition was similar to what we observed for the CD8–CIRP experiments (Fig. 2), suggesting that endogenous CaM was able to compete with coexpressed unlinked CaM1234 and at least partially reverse the effects. Because Ca2+/CaM interaction with the CIRP in α1C appeared to mediate trafficking of α1C in HEK cells, we next tested whether Ca2+/CaM was responsible for the trafficking of α1C in hippocampal neurons. Our general strategy was to compare the distribution of GFP–α1C–CaM and GFP–α1C–CaM1234 after transfection into cultured neurons using a similar method of analysis as in Figure 1D. Before proceeding with those experiments, we first analyzed whether either the addition of CaM to the α1C C terminus or the truncation of α1C after the IQ motif affected the distribution of α1C in hippocampal neurons. This concern was motivated by previous reports showing that the distal C terminus of α1C is important for localizing CaV1.2 with the machinery necessary to support CREB-dependent gene expression (Dolmetsch et al., 2001; Weick et al., 2003). When we compared the distribution of GFP–α1C–CaM with GFP–α1C, we found that their distributions were similar, both showing intense signal in the soma and prominent fluorescence throughout the dendritic arbor (compare Fig. 5A with 1C). Moreover, measurement of the distance from the soma to the farthest GFP fluorescent point in the longest dendrite for each neuron revealed no difference between GFP–α1C–CaM and GFP–α1C (Fig. 5B, data for 3 d after transfection). Thus, the distal end of α1C is not critical for α1C trafficking to distal regions of dendrites. Trafficking of α1C in hippocampal neurons is accelerated by Ca2+/CaM. A, Fluorescent confocal image of a hippocampal neuron transfected with GFP–α1C–CaM. Scale bar, 20 μm. B, Normalized frequency versus distance from soma of GFP in the longest dendrite for each neuron for GFP–α1C–CaM (n = 153) or GFP–α1C (n = 193) in cultures 3 d after transfection. C, Normalized frequency versus distance from soma of GFP in the longest dendrite for each neuron for GFP–α1C–CaM versus GFP–α1C–CaM1234 in cultures imaged at day 1 (CaM, n = 38; CaM1234, n = 44), day 3 (CaM, n = 153; CaM1234, n = 188), day 5 (CaM, n = 26; CaM1234, n = 24), and day 14 (CaM, n = 22; CaM1234, n = 25) after transfection. D, Same format as in C. GFP–α1C (WT) versus GFP–α1C (TLF) for day 1 (WT, n = 73; TLF, n = 111), day 3 (WT, n = 193; TLF, n = 130), day 5 (WT, n = 127; TLF, n = 180), and day 14 (WT, n = 32; TLF, n = 38). We therefore performed measurements with GFP–α1C–CaM and GFP–α1C–CaM1234 at several time points after transfection over a 14 d period (Fig. 5C). For the first 3 d after transfection, the GFP–α1C–CaM trafficked farther from the soma than the CaM1234-linked construct; by 5 d after transfection, the normalized frequency distributions were indistinguishable. That the CaM1234-linked construct was not retained within the soma, as might be expected from the distribution of this construct when expressed in HEK cells, likely reflects the specific manifestation of Ca2+/CaM-mediated effects on channel trafficking/targeting in polarized neurons compared with nonpolarized HEK cells. Additionally, we postulated that endogenous CaM might be able to compete more effectively with CaM1234 in these neuronal experiments because of the longer time frame. To test this hypothesis, we analyzed the time dependence of trafficking of GFP–α1C (TLF) compared with GFP-α1C (WT) over 14 d, because the mutation should prevent endogenous CaM interaction. As seen in Figure 5D, the WT channel maintained its advantage over TLF throughout the 14 d period. Underlying the formation of memory are certain well characterized types of synaptic plasticity that require Ca2+ influx and the consequent activation of gene expression cascades. Several activity-dependent gene expression pathways from synapse to nucleus have been dissected. In particular, activation of CREB has served as the quintessential model for this process (Deisseroth et al., 1996, 1998, 2003; West et al., 2002). Extensive investigation of the pathways leading to CREB activation in hippocampal neurons has revealed a privileged role for Ca2+ influx through CaV1.2 channels and the related CaV1.3 channels compared with other high voltage-activated (HVA) Ca2+ channels (e.g., CaV2.1 or CaV2.2) (Striessnig et al., 2006). Because the distinguishing feature among different HVA Ca2+ channels is the identity of the pore-forming α1 subunit, the advantage of CaV1.2 and CaV1.3 channels must be attributable to specific determinants within the α1 subunit rather than in the accessory β or α2δ subunits, which are common to all HVA channels (Ertel et al., 2000). One key component affording CaV1.2 and CaV1.3 channels their privileged role in excitation–transcription coupling may therefore be the association between their respective α1 subunits and CaM. Although CaM has also been predicted to interact with and confer Ca2+ sensitivity to gating of other HVA Ca2+ channels (Lee et al., 1999; DeMaria et al., 2001; Liang et al., 2003), the magnitude of the effect is markedly smaller, suggesting a different mode of interaction. An essential role for CaM interaction with α1C (CaV1.2) in CREB-dependent gene expression was suggested by the disruption of excitation–transcription coupling when the CaM binding IQ motif in α1C was mutated (Dolmetsch et al., 2001). Because CaM is but one CaBP that has been postulated to modulate Ca2+ channel function in neurons (Lee et al., 2002; Zhou et al., 2004; Lautermilch et al., 2005; Yang et al., 2006), our demonstration that CaM coimmunoprecipitates with α1C from brain lysates provides the first evidence that CaM is a bona fide CaV1.2 subunit and the likely Ca2+ sensor for CDI and gene expression. Moreover, the recent demonstration that CaBP4 competes with CaM to modulate CaV1.3 channels in certain neuronal subpopulations (Yang et al., 2006) may explain the apparent differences in coupling of CREB activation to CaV1.2 versus CaV1.3 channels (Zhang et al., 2006). The privileged role of CaV1.2 channels in excitation–transcription coupling may therefore derive from their specific manner of interaction with CaM. In its role as a channel subunit, CaM is positioned to contribute toward the Ca2+-dependent regulation of any of the steps in channel biosynthesis that occur after subunit assembly. We found that CaM provides a Ca2+-dependent acceleration of channel trafficking to distal regions of dendrites in hippocampal neurons. This adds to a growing list of examples in which CaM, as a constitutive subunit, modulates steps in channel biosynthesis such as trafficking of SK K+ channels (Joiner et al., 2001; Lee et al., 2003) or assembly of KCNQ1 K+ channels (Ghosh et al., 2006; Shamgar et al., 2006). For Ca2+/CaM acceleration of α1C trafficking, two results suggest that the mechanism of action for CaM most likely involves an interaction with the CaM binding pocket. 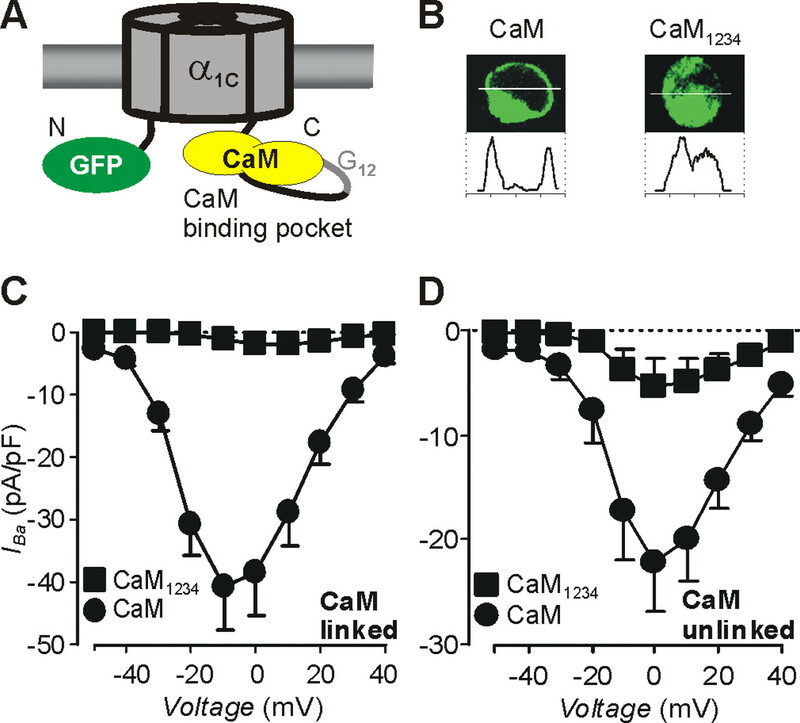 First, we demonstrated that the CaM binding pocket contains a Ca2+/CaM-dependent autonomous forward trafficking signal. This role for CaM and its binding pocket in α1C trafficking/targeting fits well with the previous observation that a region in the α1C CT, in which the CaM binding pocket resides, is important for membrane targeting (Gao et al., 2000). Second, mutations in the CaM binding pocket hindered α1C trafficking. This latter result provides a possible explanation for the decreased gene expression seen with IQ motif mutations (Dolmetsch et al., 2001); these mutations possibly altered trafficking of α1C to distal regions of the dendrites or reduced the amount of channels inserted into the membrane, thereby interfering with the gene expression cascade. In this context, it is interesting to note the previous report from Peterson et al. (1999), in which CaM1234 coexpression reduced peak CaV1.2 current amplitude in HEK cells compared with CaM coexpression. Because CaM1234 exerts its interference with CDI in a dominant-negative manner by precluding binding of CaM to the α1C CaM binding pocket, the reduced current amplitude with CaM1234 coexpression recorded in that study, as in our results here, most likely arose from decreased trafficking/membrane insertion of α1C subunits. Our quantification of gating charge and the visualization of the subcellular localization of GFP-tagged α1C subunits here offer additional confirmation. As noted previously, it is important to consider that the specific manifestation of Ca2+/CaM-mediated effects on channel trafficking/targeting in nonpolarized HEK cells may differ from that in neurons; nevertheless, the delayed trafficking in neurons and the reduced surface expression in HEK cells both appear to result from Ca2+/CaM-mediated interaction with α1C. Because the mutations that disrupted CaM interaction markedly diminished both CaV1.2 current amplitude and affected trafficking, processes normally ascribed to Ca2+ channel β subunits (Dolphin, 2003), it is possible that CaM disruption impacts β subunit modulation. Consistent with this hypothesis, we demonstrated previously that the complex of α1C CT and CaM could interact with the intracellular linker between the α1C I–II domains (Kim et al., 2004), the primary sight for β subunit interaction. Moreover, the IQ motif contains the arginine- and lysine-rich sequence 1659RKFKKRK1665, a polybasic motif that could serve as an endoplasmic reticulum retention signal (Michelsen et al., 2005). Conserved among other HVA Ca2+ channels, the IQ motif may therefore contain the elusive α1 ER retention signal, masked by CaM, that controls Ca2+ channel trafficking. The juxtaposition of CaM and the β subunit through the interaction with the I–II linker could explain the contribution of β subunits to the trafficking process. 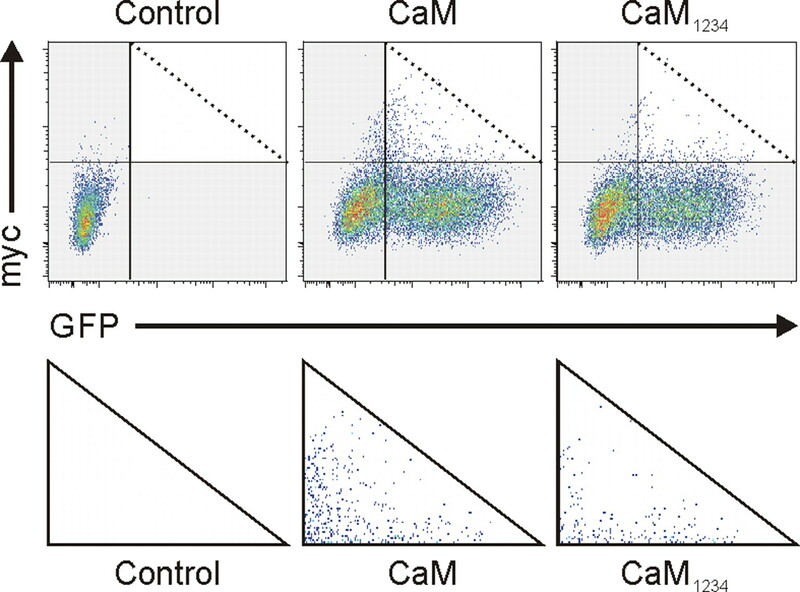 In the specific case of α1C, the dynamic regulation provided by CaM could be important in synaptic plasticity that depends on Ca2+ influx through CaV1.2 channels and is consistent with the data showing that Ca2+/CaM interaction with the α1C IQ motif contributes to activity-dependent gene expression (Dolmetsch et al., 2001). In this regard, our observation that CaV1.2 channels were located in distal regions of dendrites, consistent with recent observations (Davare et al., 2001) that describe CaV1.2 channels in spines rather than an older report that suggested that CaV1.2 channels were restricted to the soma and proximal dendrites (Westenbroek et al., 1998), places CaV1.2 channels in the proper setting to initiate synapse to nucleus signaling. Ca2+/CaM regulation of dendritic trafficking might therefore be an important component to the emerging model in which CaV1.2 channels participate in local signaling microdomains to regulate plasticity, even when the contribution of Ca2+ influx through the channels is modest. For example, long-term depression of synaptic activity depends on Ca2+ signaling through CaV1.2 channels and downstream activation of CaM kinase II in dendritic spines, yet Ca2+ influx through CaV1.2 channels is too small to be separated accurately from the dominant signal mediated by Cav2.3 (R-type) channels (Yasuda et al., 2003). Likewise, it is possible that CaM regulation of CaV1.2 trafficking may increase the local number of CaV1.2 channels in response to activity and participate in the specific role of CaV1.2 channels in NMDA receptor-independent plasticity and spatial memory (Moosmang et al., 2005). 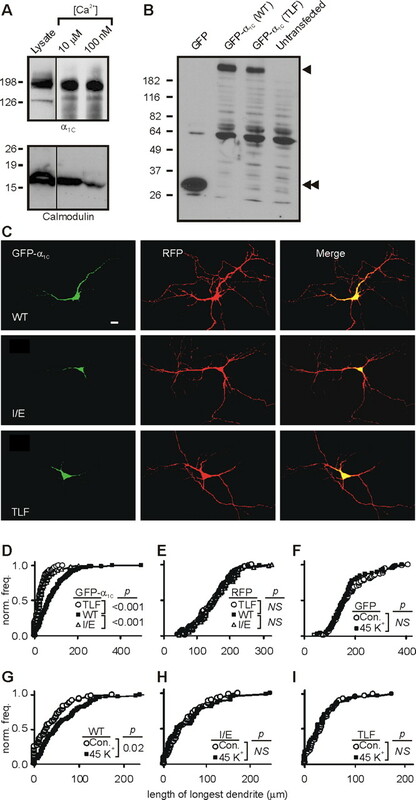 Such signaling pathways, possibly regulated by Ca2+/CaM-mediated trafficking, may be vital for plasticity on the scale of individual synapses. Hence, determining the regulators of CaV1.2 localization in the dendritic arbor will prove to be important for our understanding of learning and memory. This work was supported by National Institutes of Health Grant HL 71165 and American Heart Association Grant 0555875T (both to G.S.P.). G.S.P. is a recipient of the Irma T. Hirschl Career Scientist Award and is the Esther Aboodi Assistant Professor of Medicine. M.S.G. is supported by the Medical Scientist Training Program. We thank Leonard Zablow for technical assistance. We also thank members of the Alexandropoulos laboratory for advice, help, and reagents for FACS analysis. (2002) Calcium-dependent inactivation of neuronal calcium channels. Nat Rev Neurosci 3:873–883. (2001) A beta 2 adrenergic receptor signaling complex assembled with the Ca2+ channel Cav1.2. Science 293:98–101. (2001) Calmodulin bifurcates the local Ca2+ signal that modulates P/Q-type Ca2+ channels. Nature 411:484–489. (2003) The birth of a channel. Neuron 40:265–276. (2003) b subunits of voltage-gated calcium channels. J Bioenerg Biomembr 35:599–620. (2000) Role of the C terminus of the alpha 1C (CaV1.2) subunit in membrane targeting of cardiac L-type calcium channels. J Biol Chem 275:25436–25444. (2006) KCNQ1 assembly and function is blocked by long-QT syndrome mutations that disrupt interaction with calmodulin. Circ Res 98:1048–1054. (1998) Tagging with green fluorescent protein reveals a distinct subcellular distribution of L-type and non-L-type Ca2+ channels expressed in dysgenic myotubes. Proc Natl Acad Sci USA 95:1903–1908. (2001) The carboxyl-terminal valine is required for transport of glycoprotein CD8alpha from the endoplasmic reticulum to the intermediate compartment. J Biol Chem 276:28920–28926. (2001) Calmodulin regulates assembly and trafficking of SK4/IK1 Ca2+-activated K+ channels. J Biol Chem 276:37980–37985. (2004) Identification of the components controlling inactivation of voltage-gated Ca2+ channels. Neuron 41:745–754. (2005) Modulation of CaV2.1 channels by the neuronal calcium-binding protein visinin-like protein-2. J Neurosci 25:7062–7070. (1999) Ca2+/calmodulin binds to and modulates P/Q-type calcium channels. Nature 399:155–159. (2002) Differential modulation of Ca(v)2.1 channels by calmodulin and Ca2+-binding protein 1. Nat Neurosci 5:210–217. (2003) Small conductance Ca2+-activated K+ channels and calmodulin: cell surface expression and gating. J Biol Chem 278:25940–25946. (2005) Hide and run. Arginine-based endoplasmic-reticulum-sorting motifs in the assembly of heteromultimeric membrane proteins. EMBO Rep 6:717–722. (2005) Role of hippocampal Cav1.2 Ca2+ channels in NMDA receptor-independent synaptic plasticity and spatial memory. J Neurosci 25:9883–9892. (2004) Differential targeting of the L-type Ca2+ channel alpha 1C (CaV1.2) to synaptic and extrasynaptic compartments in hippocampal neurons. Eur J Neurosci 19:2109–2122. (1999) Calmodulin is the Ca2+ sensor for Ca2+-dependent inactivation of L-type calcium channels. Neuron 22:549–558, [Erratum (1999) 22:893]. (2006) Calmodulin is essential for cardiac IKS channel gating and assembly: impaired function in long-QT mutations. Circ Res 98:1055–1063. (2006) Role of voltage-gated L-type Ca2+ channel isoforms for brain function. Biochem Soc Trans 34:903–909. (2006) Switching of Ca2+-dependent inactivation of CaV1.3 channels by calcium binding proteins of auditory hair cells. J Neurosci 26:10677–10689. (2003) Plasticity of calcium channels in dendritic spines. Nat Neurosci 6:948–955. (2004) Ca2+-binding protein-1 facilitates and forms a postsynaptic complex with Cav1.2 (L-type) Ca2+ channels. J Neurosci 24:4698–4708.